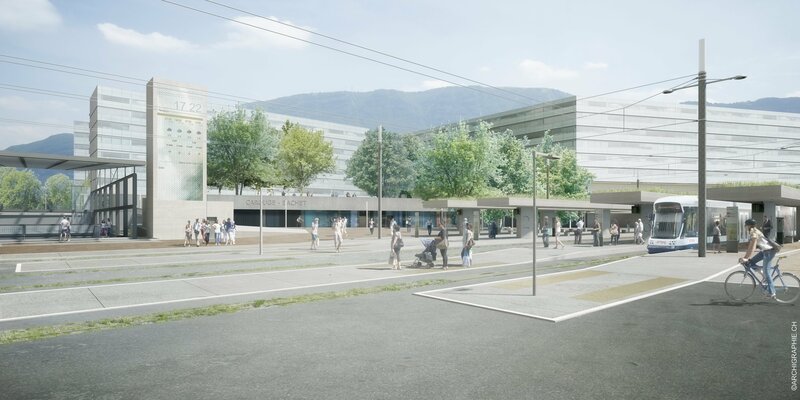 Located at the southern entrance of Geneva, the Carouge-Bachet station acts as an important transportation hub. The diversification of the offer in terms of transportation gives this territory, until now considered a peripheral region, a whole new attractiveness. 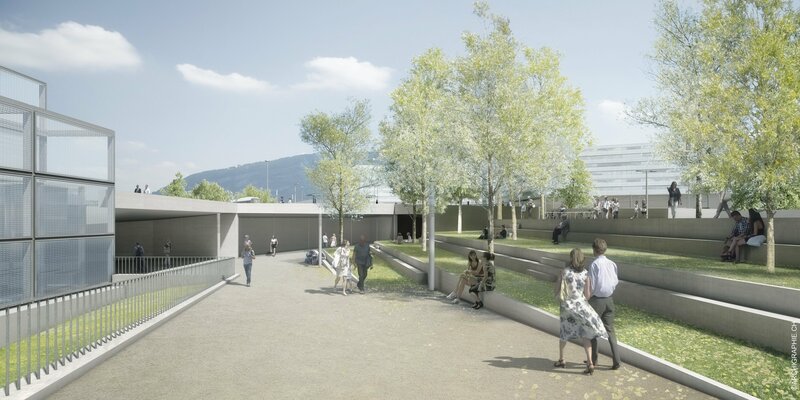 The project, winner of the competition organized 2011 by the State and the city of Lancy, concerns public spaces and the organization of the connections. It aims at integrating residents and users' needs and at reducing the separating effect of big infrastructures. Links between neighbourhoods - A new square structured in two terraces building a continuity with the surrounding neighbourhoods. 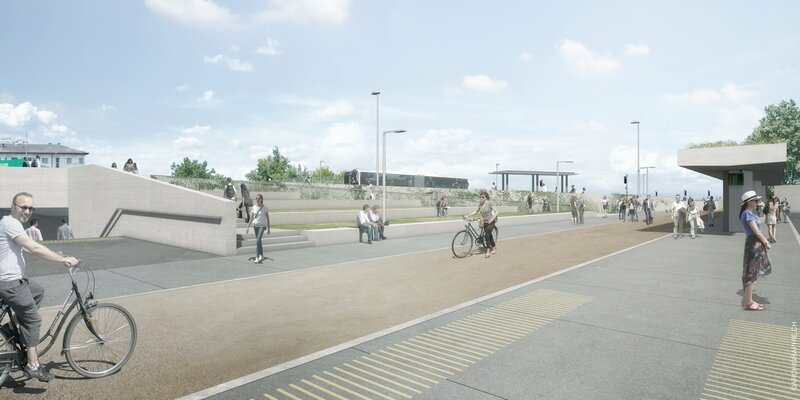 Situated at the base of the Gui square, a bike station and a few other community services complete the offer of the platform. The way under the St.-Julien road is widened and improves the connection between both station exits and the areas of La Chapelle, Praille Acacias Vernets and the Trèfle-Blanc. 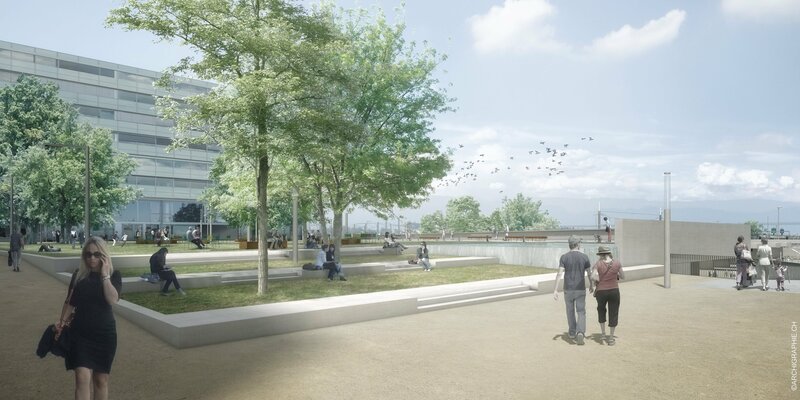 Promenades - The Sports and la Chapelle walkways offer extensive exchange and encounter possibilities and the new ice rink reflects the urban vitality of this interchange centre. The geography of the sector, at moraine edge, is enhanced by landscaped areas located under the motorway infrastructures. Night identity - Light poles are spread across the space and confer a pleasant rhythm. ￼Commentaire [ASCBW1]: cela reste- t-il en français? noue ￼￼￼ ￼The TPG roofing provides indirect lighting to tracks and platforms. The disc of the tram loop is animated with colourful effects and guides pedestrian flows. The Gui square, its terraces and its water basin are illuminated by a festive lighting. The development of the project enabled to relocate the P+R, initially encroaching on the space, which is now integrated underground, under a future block. 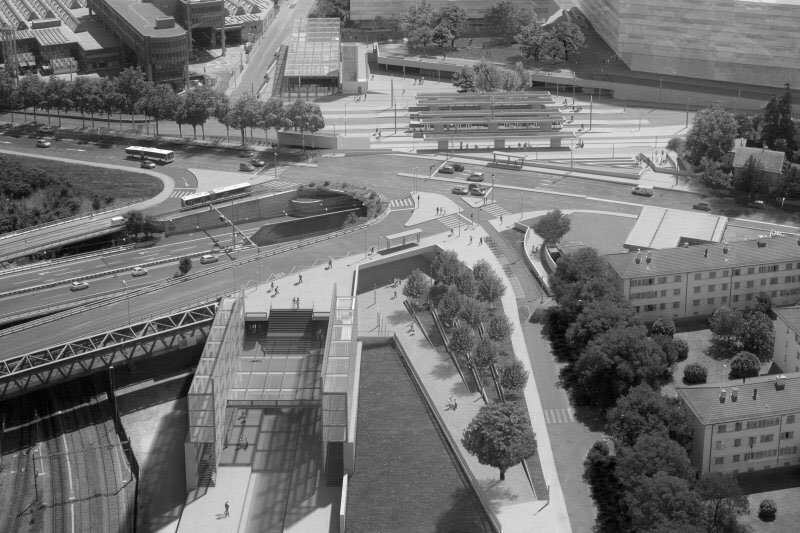 In order to widen the space of the square, the tram loop was pushed some sixty meters away. Yet the idea of widening the underpass had to be left aside for economic reasons.